Nowadays SBCs (Single Board Computers) such as the famous Raspberry-Pi are very popular for using as home-servers because they are very cheap, use very little space, and have very low energy consumption. 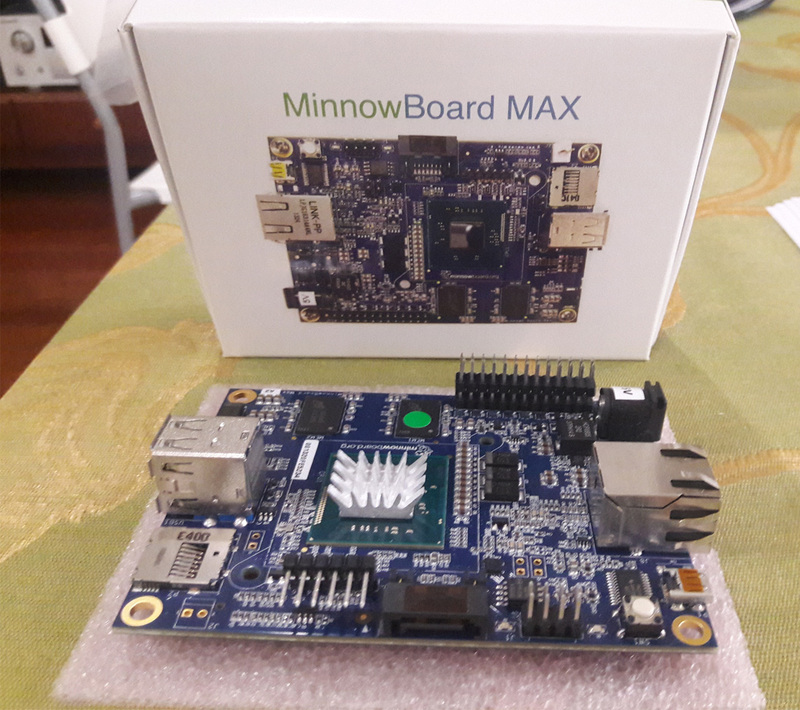 For these reasons I have decided to go for a SBC, but for a more expensive model called the MinnowBoard MAX. 2 GB of RAM : useful for distributed computing tools. Some frameworks won’t even run with only 1 GB. USB 3.0 port : convenient for an external hard drive, as USB 2.0 HDDs are typically limited to 40 MB/s. SATA port (theoretically good, but which I didn’t use, read further). It has an x86_64 Intel processor, which enables to run any kind of software, whereas some libraries will not run on an ARM (unless you try to compile them yourself). Below are the different available storage media on MinnowBoard. Micro SD is Flash memory so it can only support a limited number of writes before dying. This is bad to store an Operating System since it requires constantly lots of writes. Even a Class-10 is a lot slower than an external HDD. Thumbrives are also Flash memory so they are not too suitable to install an OS. However it did show better performance than a Micro SD in my case (see benchmark in the next paragraph). They are a bit more expensive for small memory (≤ 32 GB) but get a lot cheaper than Micro SD if you when you get to bigger sizes (≥ 128 GB) and keep your standards up to USB 3.0 and Class-10 respectively. The MinnowBoard MAX has a USB 3.0 port, which enables a high potential for external HDD disk throughput. For any given size above 500 GB they are a lot cheaper than thumbdrives and micro SD cards, and have a longer life expectancy. Now let’s put these 3 types of storage to the test with some of the latest models currently on the market. Here is a little test on how long it takes to copy/paste a 3.5 GB file on each of these devices. Another storage medium that can be used here is a NAS (Network Attached Storage), connected to the rack switch. A NAS is a storage server which can use RAID to accelerate IOs and/or for redundancy for backup. Each board could have their OS and data partitions stored on the NAS and wouldn’t need individual DASs. The network speed to the NAS would probably be an issue since all nodes would constantly we reading/writing at the same time. This is not Hadoop’s philosophy, which prefers using JBOD (Just a Buch of Disks), since it already takes care of replication at a software level. The SATA port is not completely standard. You can’t just buy an SDD drive and plug it. According to what I’ve read on the net, some special customization has to be made and it sounds a bit risky. This blogger did it and his solution involves using a different kind of connector and cutting out cables. This page says the polarity is wrong and you might break stuff if you connect an SDD. SSD is expensive (around 150$ vs 40$ for 500GB Samsung SSD vs HDD). If it turned out not to work, what would I do with an SSD drive? I don’t even own a desktop computer. 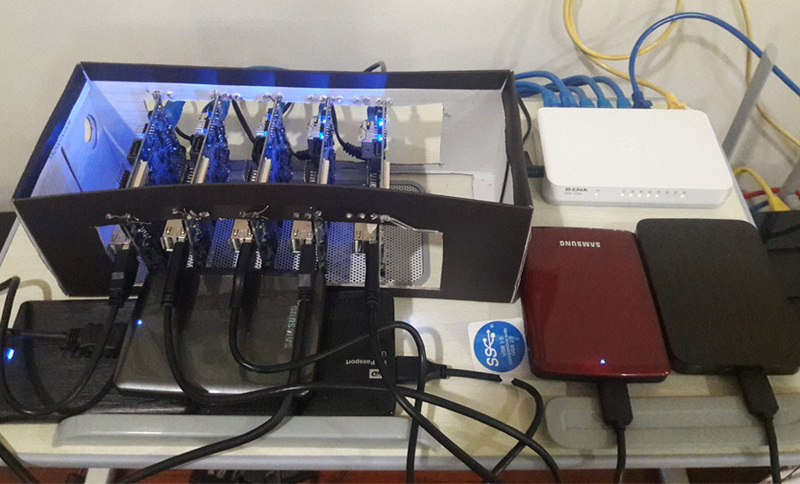 So I chose to use External HDDs in my cluster, and needed to get 5 disks for my 5 MinnowBoards. I bought a few different brands of HDD to limit my chances of ending up unlucky with 5 units of the slowest model on the market. One exception is Samsung, which offer 500TB P3 and M3 models for around 38$. For the “Read+Write” test, I just copied a big file from the disk to itself and timed it. Average of 3. And that the cheapest (Samsung P3) was the fastest overall ! I tried the “Read+Write” test on my laptop’s internal 1TB Toshiba HDD and the average speed was 26.9 MB/s. So I guess the external hard drives are as good as an internal one. I also tried the “Read+Write” test on my laptop’s internal 64GB Samsung SSD, and the average speed was 100.0 MB/s. The reason why “Read+Write” is a lot slower than “Read” and “Write” is because HDDs have very slow seek time, so when reading and writing multiple files in parallel makes it slow down a lot. That is also why the SSD of my laptop is very fast, seek time is incredibly small in SDDs (about 150 times faster). I bought a D-Link Gigabit 8-Port switch. It costs around 20$ only and it would be a bit stupid to go for the FastEthernet (100Mbps) version and ruin the whole cluster performance just to save 5 bucks .. There are also 10-Gigabit switches on the market, but they are way too expensive. Around 800$ for an 8 ports and 1400$ for a 16 ports. I used Category 6 cables to get the maximum possible out of the theoretical 1 Gigabit throughput. Category 5e are also supposed to be good enough on short distances, but for less than 2$ a piece I went for the Cat. 6. The max speed between computers using this setup should be 1 Gbit/s = 125 MB/s. I have sent big files by FTP from my laptop’s SSD to Minnowboards’ External HDDs at a rates of around 90 MB/s, which is close to the external HDDs max write speed. So the transfer is probably bottle-necked by the write speed of the HDD. So I consider this network setting to be sufficient. As you can see in the picture below, I decided to crudely attach my boards inside a shoebox. The shoebox has been cut open on most sides, and mounted on a specialized desktop stand, which has integrated ventilation (notice the gray holed plate below the boards). The air is comes in from below and is ventilated up through the MinnowBoards. Ventilation is important, as I have noticed some boards unexpectedly shutting down when I was using the first version on my shoebox without ventilation and without side and bottom openings. As you can see, the “Top-of-Rack” switch is the white box on the top right corner. Each board has an external HDD connected to the USB 3.0 port on the front side. Well, technical stuff and benchmarks are nice, but how about MONEY ?? It’s what matters in this world isn’t it ? Right. I didn’t keep all the receipts, and I’m lazy so prices are averaged sometimes, but here is an approximate cost breakdown for such a cluster. The USB Hub and HDMI cable are necessary if you don’t have them (explained in the next part). For the sake of simplicity, this total is theoretical for someone living in the US or in a country where they sell MinnowBoards locally, because I live in Malaysia and ordered the boards from the US, which cost me a lot for international shipment. So the total value of the cluster is around 1000 US$ ! That’s quite expensive. But can the price be justified ? Does it work well ? Read the next pages to find out ! First, let’s set up the cluster.